Scientific investigations are organized attempts to seek out, describe, explain, and predict natural phenomena. Scientific investigations are often performed to explore new phenomena, verify the results of previous investigations, test theoretical predictions, and discriminate between competing theories. 1. List and describe a few of the types of scientific investigations listed in Study Island. 2. 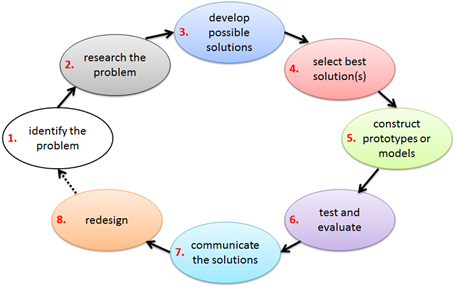 Create you own hypothesis about a topic, a hypothesis that can be tested. Write your hypothesis and tell what type of scientific investigation would be needed to test it. View the Lab Safety Cartoon (use the attachment below to see it) to answer the questions below. Use information from Study Island for help. Make sure you submit your answers in the online document below...some questions are cut off, so scroll to the right to view the whole question. Technology is the application of scientific principles to solve problems and accomplish tasks. Technological design is the process of finding the best solution for a problem that is also within the given constraints. Over the past 100 years technology has helped shape our lives more than ever. For today I want you to explore the website links below and discover what are thought to be the most influential inventions of the past 600 years. 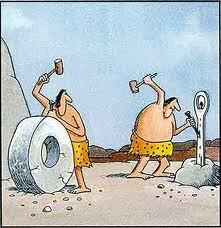 Technology is the use of knowledge, tools, and materials to solve problems and accomplish tasks. Technology can have both helpful and harmful effects. List 5 advances in technology or inventions and describe how they benefit life and also how they can potentially be dangerous or negatively effect life. This Week finish all assignments in Section 4. in Study Island. Once finished play review games to help you study for next Week. Next Week we will take a comprehensive assessment over this section. This will count for a grade so make sure you Review. Take your time on the review games and answer them correctly. A wave is a moving disturbance that transfers energy through matter or space. 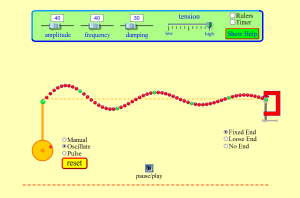 Set the wave simulator to "oscillate" and "no end"
What happens to the waves when you increase amplitude? What happens to the waves when you decrease amplitude? What happens to the waves when you increase frequency? What happens to the waves when you decrease frequency? Notice that the dots on the wave go up and down while staying somewhat in place...explain why this happens...make sure you use what you know about energy waves to answer. Energy can be transformed, or changed, from one form to another. 1. Provide an example of chemical energy transforming. 2. Provide an example of the Sun's nuclear energy transforming. 3. Provide an example of thermal or heat energy transforming. 4. 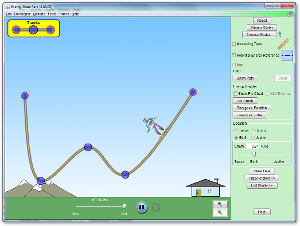 Provide an example of potential energy transforming to kinetic energy. List the 7 types of energy listed on page 1 in study island. Complete the simulation below...as you change the variables for the skater what happens to the amount of energy used? Explain what the Law of Conservation of Energy is. Humans depend on energy for many activities every day. There are many different ways of obtaining, transforming, and distributing this energy, each of which has different environmental consequences. Select an energy source (renewable or nonrenewable) and make a case or argue why it is the best source of energy for people to use. Include at least five facts about the energy source (for example, location, how abundant it is, is it renewable/nonrenewable, cost, and so on...). Include at least on professional source other than study island with your answer....no Wikipedia this time, fine a credible website dedicated to your energy source....copy and paste the web address in your post.